Isekai Izakaya is a series I wouldn't recommend to anyone. Not because it's so bad but because it is so different. The approach is original to a point that it doesn't even feel like an anime. The point of the series is to offer a trip to Japanese cuisines and food culture. The entire series centers around this certain Japanese restaurant and its customers who tend to change episodically. In generally, our customers have the role of foreigners who are absorbing and experiencing the Japanese kitchen for the very first time. This is executed in rather immersive self-insert manner. We end up seeing episodes where customers describe what type of a food they want (many of the characters seem to be real culinary pros) and our kitchen master prepares what they requested, but in the Japanese way. Our customers serve the idea and add to the viewing experience. They vary from rather manly men to small children. Even the adult men can occasionally almost lose their self-control over food because they are just that hyped to try it out. In generally, character reactions are powerful. They are living in the moment, not currently caring about anything else than the food that is being prepared and then eaten. When characters are finding the concept this fascinating, it's easy to share their interest. From it's setting, I'd compare this work to Thermae Romae, the award-winning series centering around Roman bath architect who travels in time to modern Japan to discover the future of bath houses. Isekai Izakaya is on parallel with Thermae's idea, and not only that, every episode we see ends with a live action segment where real Japanese master(s) shows us the recipe behind the current episodic dish and shows from scratch how it was made. The simple idea for the anime and the execution that relies on love for food create an atmosphere that is bound the make the viewer hungry for more. 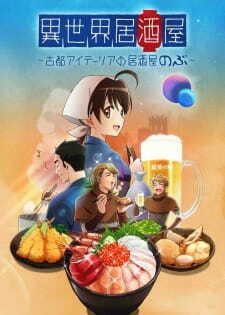 Isekai Izakaya is nothing less than an unique piece of anime and for that reason its target audience will be very limited. There are bound to be viewers who won't even see why such a series was made. I find it very hard to believe that any underage person would ever find this show appealing. This is an anime for adults. To me, this was nothing less than fresh air. I appreciate everything this anime did and accomplished. Those who are planning to move to Japan should also consider watching this. This show reminds me of Isekai Shokudou, only less stellar in both quality and storytelling. And granted, both the former and latter are based on light novels of their respective names, of which Izakaya Nobu premiered in 2014 and Shokudou the year after. Yet, when the anime adaptations of both series came out, it was pretty obvious that the production here by Sunrise wouldn't garner the popularity of the latter by Silver Link the year prior. Both series exist in another world (which gives rise to the tiring Isekai genre troupe) through restaurants, offering occupants (where they are able to access the place from) to experience food like they have never tasted before. As expected, they leave the place in happiness, laughter and whatnot, just to come back again for more. Isekai Shokudou offers diversity by featuring what seems to be like the episodic formats of people from different walks of life: Either both mortal or angels or whatnot, to come experience the numerous food to their liking. Izakaya Nobu on the other hand, the restaurant just stays at that very same place in Aitheria, and the numerous stories ensue with the workers (Shinobu, Taishou) about the events happening in Aitheria, and nothing more. The deal-breaker (at least for me)? Isekai Shokudou at least tries its best to offer that diversity by watching the various people, may it be fairies, humans on their journey to experience food they won't experience again (coming on the next day of Satur (which is present-day Saturday)), the once-in-a-lifetime food. Isekai Izakaya Nobu is pretty much the same, just instead of Shokudou's diverse people-centric plot, it's specific to the day-to-day events of the townsfolk of Aitheria and just feels meh. The characters in both series serve their purpose, but as mentioned, Isekai Shokudou beats this series down by a long shot. Shokudou's restuarant occupants are far more interesting to learn and appreciate their backgrounds, but Izakaya Nobu is far too generic, and generally unimpressive, but not bad either. Of course, with a runtime of 15 mins per episode, and reading the manga adaptation at the same time, I just barely made it through all the way. The adaptation is of course faithful, but the stories contained are short. I'd guess why we got the live-action Nobu Plus segment for the last half of the show (aside from the ED), and that offers real places and recipes for any aspiring people learning to cook. With that said, art and animation is OK, nothing to write home about. And music? It's minimal to the point of oozing and satisfying everyone's tastebuds with all the SFX of the cooking (sizzles and fizzs and such) that wants to make you give a try. The ED is also generic but fine by my tastes. Prosit! In all senses though, if you love anime and are a foodie, I can recommend this series, though I'd much rather quote Isekai Shokudou as the superior must-watch, because everything in Shokudou is memorable compared to what's offered here. Not a bad show overall, but not something that I would come back to in the future. If you like Alcohol and Fried Food this is your anime. I don't know about you but this is the anime I watch when I'm eating or/and drinking. Have in mind that Izakaya is like a japanese restaurant/ bar where you go drink a lot and eat a lot so this is what the anime is all about: Alcohol especially sake and beer.So 18+ is a must for viewers. Story 8/10 : the story is weak for my standard but it is not like you are not gonna enjoy it, it may seem silly but i find funny and enjoyable. Art 9/10: Wow the food and the beerl looks really apettizing! there is not a lot to see landscape-wise. the anime revolves around the izaka so that is where you gonna spend most time watching. Although for the last 5-10m you are gonna watch an old dude eating or a young dude cooking which is new. Sound 8/10: ok ending and op , OST are ok nothing memorable. Characters 8/10: some are forgettable maybe the chef and the girl assistant are good , the guard are the funny characters and that's it. Enjoyment 10/10: As I say before I love the food and the beer and how the anime convey us that eating and drinking are one of our life pleasure. However, i would like the anime to be more lengthy. the old dude is ok but since I know i wont have the opportunity to go to japan is a miss. The cooking dude is great very creative maybe one day i will try cooking those dishes he teaches us. When “Isekai Shokudou” first came out it barely made a blip on my radar, but as I’ve learned before I shouldn’t knock a show till I’ve seen it. It came as a nice surprise. An anime that I could just chill out with (i was also having a hard time controlling my stress than, and this anime always helped calm it down). Not the best anime ever, but one that was simple yet enjoyable. So seeing this show was similar I was looking forward to seeing it. I didn’t think it would be as good and “Isekai Shokudou”, but I would at least enjoy it to some small degree. Unfortunately, ‘some small degree’ happened to be what I was in for. I should start by saying that it’s not a bad show, there are plenty worse around. It’s just............. (how to put this).......... When I think about “Isekai Shokudou” I feel it’s a sort of general anime, and anime that any can enjoy. While “Isekai Izakaya Nobu” feels like it’s aiming at a younger demographic. Which is fine, if you are going to aim for a certain age group than you have every right. It’s just that it doesn’t really appeal to me. The over-the-top reactions when they try the food just don’t sit well with me, and it feels like the episodes are rise-and-repeat. There are a few differences between how the characters react, but it definitely follows a formula. Also whereas “Isekai Shokudou” focused on the character shown in that segment (again with a few exemptions) “Isekai Izakaya Nobu” really didn’t. They have a regular cast of characters (some with more personality than others) but we don’t really follow them, the show focuses more on the food and the person’s reaction to it. Which is fine, but it lacks the deeper sense of character that the cast in “Isekai Shokudou” had. I guess that is what it boils down to. “Isekai Izakaya Nobu” is just a watered down version to “Isekai Shokudou”. The characters, the atmosphere, it all is lacking........ something..... (crap, I always tend to lose the end of what I want to say)..... Guess I fall back to what I normally do when I want to make a comparison, and since these are shows about food it will fit right in. It’s like the difference between getting a chicken dinner and getting chicken nuggets. Both are chicken and each have their own flavor, but one definitely has more to offer than the other. I have a few other issues with it but I think I got the main point across, and this feels long enough so I’ll just leave it at that. Again this show is not bad. Just a meh sort of show. I’ll continue with it just because it’s something to watch, but at the end of the day it’s going to be something I’ll easily forget about.